Item number 2615/7 from the MOA: University of British Columbia. Woman’s red tie-dyed head cloth, hand-dyed and hemmed on all sides. Cloth has a green tie-dyed stripe near the two shortest sides. The abstract designs on the main body of the cloth are formed exclusively by orange and flesh coloured globules with red centres. Both floral and bird shapes are prominant in these designs. Black dots appear throughout, as well as a few circular shapes formed from bunched black thread. Inscription in two opposing corners. 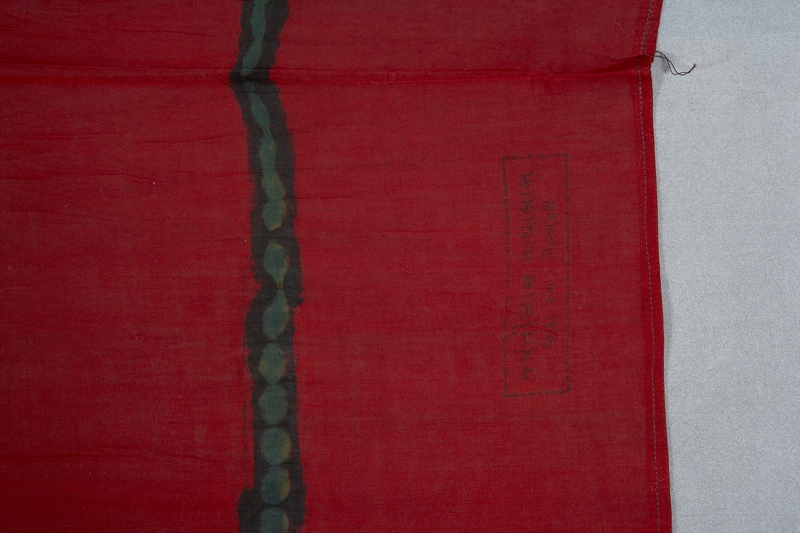 Headcloths of this type were worn by women of the Hindu Koli caste. Members of that caste assisted in the production and gathering of this clothing. The cloth for the clothing was purchased in Kodinar town, 7 km. to the east of Dhamlej. They were worn with elaborate blouses, which were also worn by other castes. Koli women also wore distinctive jewellery, including small bracelets called bangli in Gujarati made of plastic or gold, silver ankle chains called chhdi, solid silver anklets called sakada, and large gold nose rings called kadi. 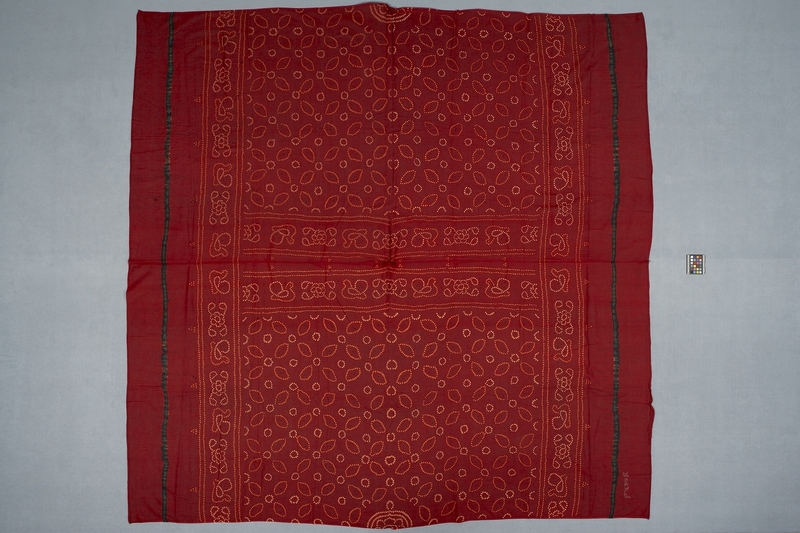 This head cloth was collected with the help of Hindu Koli people. This collection was gathered with the enthusiastic participation of villagers in Dhamlej, reflecting Derek Johnson’s rapport with them. They allowed him to take photographs of them demonstrating how the clothing is put on and worn. These photographs are available in the Museum of Anthropology collection documentation file for accession 2615. The fact that the cloth was tie-dyed by hand is indicated by its texture and by the fragments of black thread used in tying that remain. Tie-dyed by hand with black cotton thread to resist the base dye.